As part of our efforts to describe all of our collections online, a number of new finding aids have been posted during the spring semester. Collections from the Archdiocese of Newark that have had new finding aids posted include the papers of three auxiliary bishops, the records of several offices of the Archdiocese, and the records of some related organizations. Collections from University Archives include the papers of a number of past presidents of the University as well as the records of the College of Education and Human Services and the National Defense Language Institute. Manuscript collections include the papers of several important figures in University history as well as documentation on events in the Archdiocese. The papers of three auxiliary bishops of the Archdiocese, Bishop Justin J. McCarthy, Bishop Martin W. Stanton, and Bishop Joseph A. Francis, now have finding aids and catalog records. The Justin J. McCarthy papers, 1936-1959, ADN 0003.004, include the sermons and lecture notes of Bishop McCarthy, who was a graduate of Seton Hall College, Immaculate Conception Seminary, and the North American College in Rome, was the pastor of Our Lady of Sorrows in South Orange, and was a spiritual director of and professor of theology at Immaculate Conception Seminary in the 1930s-1950s. The Martin W. Stanton papers, 1957-1977 (bulk 1957-1961), ADN 0003.005, are the papers of Bishop Stanton, a New Jersey native who attended the Immaculate Conception Seminary and Fordham University, where he received his doctorate in sacred theology, and who attended all sessions of the Second Vatican Council; the collection includes correspondence from Bishop Stanton’s time in Rome for the first session of Vatican 2 as well as correspondence on his ordination as bishop. The Joseph A. Francis papers, 1934-1997, ADN 0003.011, are the papers of Bishop Francis, the fourth African-American Roman Catholic bishop and the first ordained in the Northeast, and who was an important figure in discussions of race and religion in the United States; the papers include correspondence, writings, sermons and speeches, photographs, and awards. 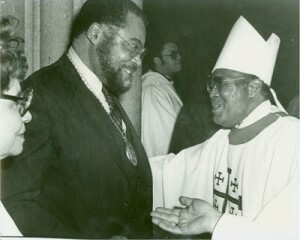 Bishop Francis and James Earl Jones, in the Joseph A. Francis papers, 1934-1997, ADN 0003.011. Several offices or former offices of the Archdiocese of Newark have generated collections which are now described in online finding aids and in the catalog. The Apostolic Nuncio records of the Archdiocese of Newark, 1950-2000 (bulk 1987-2000), ADN 0031 are the records gathered by the Archdiocese of Newark from communication with the Apostolic Nuncio, who is the top diplomatic representative of the Holy See to the United States and is usually the point of contact for American bishops and dioceses to the Vatican. This collection includes a variety of correspondence as well as materials related to the Rome and Vatican City Project Overview. The Mount Carmel Guild of the Archdiocese of Newark records, 1929-1974, bulk 1929-1937, ADN 0040, documents the activities of the Mount Carmel Guild, a division of the Associate Catholic Charities providing assistance to individuals and families in need that has since been absorbed into Catholic Charities of the Archdiocese of Newark; the collection includes materials related to the soup kitchen, ministry to individuals seeking American citizenship, ministry to the physically and mentally handicapped, and social justice work performed by the Guild. The Office of Research and Planning of the Archdiocese of Newark records, 1975-1989, ADN 0063, includes materials related to the work of the Office of Research and Planning, which defines Archdiocesan goals, develops and directs the overall short and long range plans and objectives of the Archdiocese, and develops programs to meet the needs of the Archdiocese. Projects documented in the collection include the merger of Associated Catholic Charities, the office of the Secretariat, Archdiocesan hospitals, ethnic studies, and team ministries. The Vicar for Religious of the Archdiocese of Newark records, 1930-1974 (bulk 1950-1960), ADN 0073, contain the records from the office of the Vicar for Religious, now known as the Delegate for Religious, who serves as the liaison between the Archbishop and members of religious orders in the Diocese; this collection primarily consists of correspondence between the Vicar and members of women’s religious communities on topics including contracts for teachers, ceremonies, canonization of Foundresses of orders, and other concerns. Organizations related to the Archdiocese of Newark also have collections with new finding aids. The Legion of Decency of the Archdiocese of Newark records, 1954-1978, ADN 0055, are the records of the Legion of Decency, an organization dedicated to determining the moral content (objectionable or acceptable) of motion pictures in the United States, which was later absorbed into the organization that became the United States Conference of Catholic Bishops; the collection primarily consists of index cards with the titles of films and a rating given by the Legion, as well as some correspondence and documentation related to activities in Essex County. The Fratres in Unum newsletters, 1963-1969, ADN 0057 includes issues of Fratres in Unum, a newsletter created by priests of the Archdiocese for priests discussing social issues as well as local concerns. The à Kempis of New Jersey records, 1984-1997 (bulk 1991-1997), ADN 0082 include records for à Kempis of New Jersey, a women’s charitable organization that hosted speakers and raised money for charity. The records of the first several Presidents of Seton Hall University have had new finding aids published this semester, including Bernard J. McQuaid, Michael A. Corrigan, James H. Corrigan, Joseph Synott, John A. Stafford, James F. Mooney, Thomas H. McLaughlin, Francis J. Monaghan, James F. Kelley, John L. McNulty, and John Joseph Dougherty. The Office of the President and Chancellor records include the professional papers of these men as well as some personal items, and range in size and scope from the Office of the President of Seton Hall University: James H. Corrigan records, 1877-1888, SHU 0003.004 and the Office of the President of Seton Hall University: Joseph Synott records, 1898-1899, SHU 0003.006, each containing only two items, to the Office of the President of Seton Hall University: John Joseph Dougherty records, 1959-1969, SHU 0003.013, which is 11 linear feet of material from the President who oversaw a large expansion of facilities and the introduction of co-educational classes. The contents of the collections vary somewhat, from the Office of the President of Seton Hall University: Bernard J. McQuaid records, 1865-1866, SHU 0003.001, which consists entirely of correspondence to the first President of the University, to the Office of the President of Seton Hall University: John L. McNulty records, 1931-1970, SHU 0003.012, which includes everything from appointment books to speeches to legal files to personal files. The Office of the President of Seton Hall University: Michael A. Corrigan records, 1869-1873, SHU 0003.003, includes correspondence and bills from the man who left the position of President to become Bishop of New York. The Office of the President of Seton Hall University: Francis J. Monaghan records, 1932-1936, SHU 0003.010, Office of the President of Seton Hall University: James F. Kelley records, 1920-1995, SHU 0003.011, Office of the President of Seton Hall University: Thomas H. McLaughlin records, 1923-1946, SHU 0003.009, Office of the President of Seton Hall University: James F. Mooney records, 1900-1928, SHU 0003.008, and Office of the President of Seton Hall University: John A. Stafford records, 1889-1907, SHU 0003.007 all also document times of change and growth in the University and its community. Functions and policies of the University are also documented in the Office of the Associate Provost of Seton Hall University: Joseph Stetar records, 1984-1990, SHU 0005.007. In addition to records from administrative offices, the University Archives also holds the records for many individual schools, colleges, and departments, three of which had new finding aids published recently. The College of Education and Human Services of Seton Hall University records, 1956-2002 (bulk 1956-1977), SHU 0013, primarily consists of annual reports, curriculum guides, alumni event programs and information, surveys and reports on teacher certification, bulletins, and some photographs. The School of Health & Medical Sciences of Seton Hall University records, 1987-2000, SHU 0017, primarily documents conferences, budgets, development of programs within the department, and correspondence. The National Defense Language Institute at Seton Hall University reports, 1962-1974, SHU 0035, documents a non-current program that was run by the United States Armed Forces, partnered with colleges and universities, to teach military personnel (and later civilians) a variety of foreign languages. The personal collections of several faculty and benefactors of Seton Hall University have recently been made available via new finding aids and catalog records. The William T. and Marie Henderson family papers, 1930-1989, Mss 0008, are the papers of William and Marie Henderson, who were very involved with the University and South Orange communities and who were generous benefactors of the school; the collection includes correspondence and materials documenting the couples’ involvement with various charitable organizations. The Rose Thering papers, 1944-2005, Mss 0016, are the personal and professional papers of Sr. Rose Thering, a sister of the Order of Saint Dominic, professor at the Institute for Judeao-Christian Studies at Seton Hall University, outspoken activist in favor of Judeao-Christian relations, and an instrumental figure in the creation of legislation in 1994 mandating that the Holocaust be taught in New Jersey schools; her work was also referenced in deliberations for the Nostra Aetate: Declaration on the Relation of the Church to Non-Christian Religions, a document adopted at the Second Vatican Council that reversed the Roman Catholic Church’s official position on relations with the Jewish religion and people. 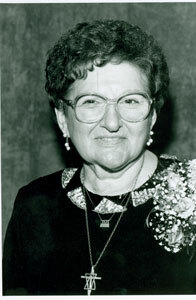 Her legacy is remembered in the Sister Rose Thering Fund, an endowment created to provide assistance to teachers in taking courses in Jewish-Christian Studies. The collection includes research materials, correspondence, photographs, and other materials. The Miriam Rooney papers, 1930-1965, Mss 0039, are the papers of Miriam Rooney, a lawyer, the first dean of the Seton Hall University Law School (making her the first female dean of a law school in the United States), and a professor of law; the collection includes letters from friends, a diary, photographs, and religious papers. Portrait of Sister Rose, in the Rose Thering papers, 1944-2005, Mss 0016. Two additional collections related to Catholic subjects in the New Jersey region have had finding aids posted this semester. The Collection on the Cause for Pierre Touissaint, 1991-2000, Mss 0036, was created from two separate donations to the Center regarding the cause for sainthood of Pierre Touissaint, who was born into slavery in 1766 in what is now Haiti and moved with his family and master to New York; the collection primarily consists of newspaper clippings describing the life and cause for sainthood of Pierre Toussaint, as well as photographs, correspondence, and mass cards related to Pierre Toussaint. The Collection on Pope John Paul II’s visits to the United States, 1979-1996 (bulk 1995), Mss 0044, documents the visit of Pope John Paul II to Newark and surrounding areas in 1995 through documents, memorabilia, photographs, and other materials, and refers to previous visits the Pope made to the United States. All of these collections and many others are available for research at the Monsignor William Noe Field Archives and Special Collections Center Monday through Friday, 9-5. Please call ahead to make an appointment to view materials, or visit our web page for more information. Some materials are available online through our Digital Field Archives and Special Collections Center, and the number of digital items available any time continues to grow. Stay tuned for further developments and more fascinating materials from the Vault!